As someone with short and stubbornly straight eyelashes, I’m always on the lookout for the next best waterproof mascara. For the record, my longtime favorites are CoverGirl Professional Waterproof and Maybelline Full ‘n Soft Waterproof (which is inexplicably no longer available on the Canadian market). A year or two ago, I happened to see a waterproof mascara recommendation for lashes like mine, by a Finnish company called Lumene. I haven’t tried much in the way of Scandinavian cosmetics (just GOSH, H&M, and IsaDora, I think), and it seemed interesting enough to try out. It was available on Amazon to US addresses, so I had it mailed to family who brought it up for me. 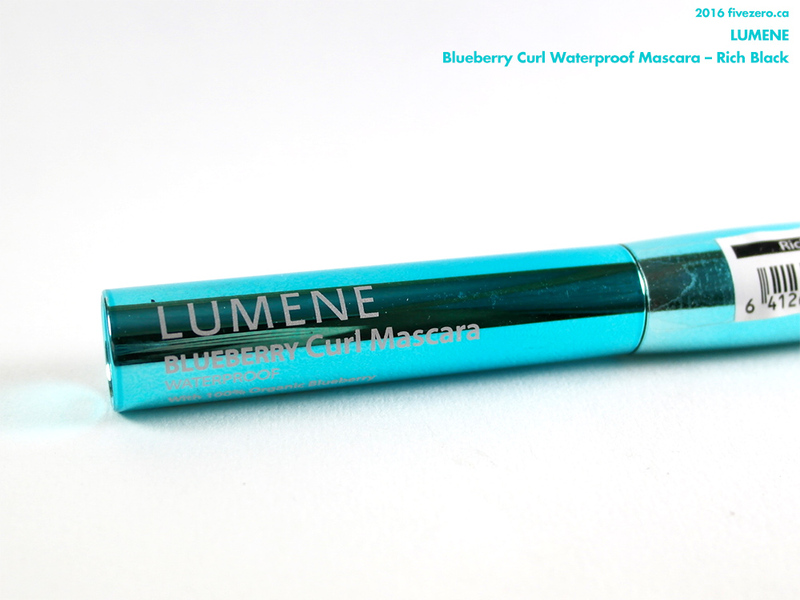 I finally got around to trying this mascara last month—actually it looks like I waited too long, because Lumene have now revamped their lineup, and the closest product to this Blueberry Curl Waterproof Mascara is the new Blueberry Wild Curl Waterproof Mascara. The packaging kind of looks the same, so I’m hoping it’s just been renamed and is basically the same product. Here are the ingredient lists from my old version and the new version. It looks like there are only minor differences in ingredient order (and a fixed typo). ISODODECANE, GLYSERYL ROSINATE, DISTEARDIMONIUM HECTORITE,SYNTHETIC BEESWAX, MAGNESIUM CARBONATE HYDROXIDE, TRIHYDROXYSTEARIN, KAOLIN, ALCOHOL, POLYETHYLENE, VACCINIUM MYRTILLUS SEED OIL, AQUA (WATER), PHENOXYETHANOL, PROPYLPARABEN, METHYLPARABEN. MAY CONTAIN: (CI 77499) IRON OXIDE. Judging from this review of the new version, the packaging at least has remained the same, including the brush. 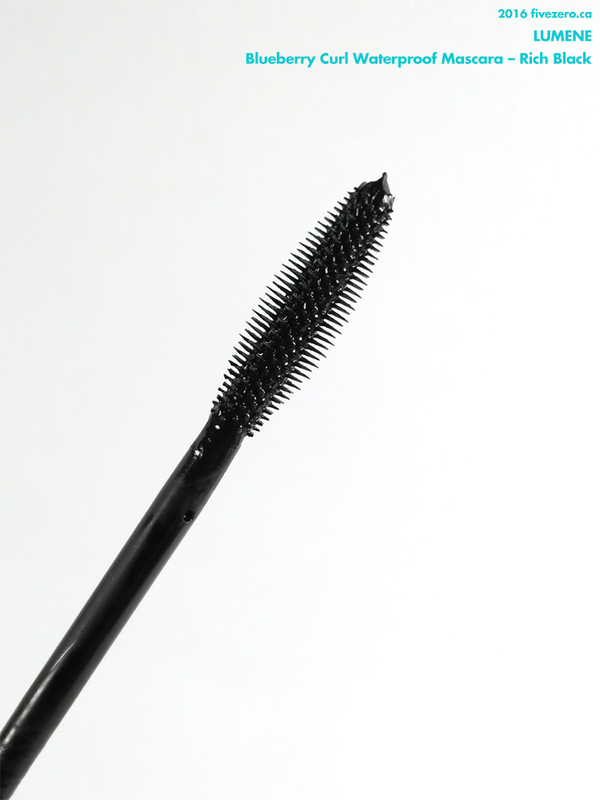 The brush is a flexible plastic one, and from trying a few of the CoverGirl Lash Blast mascaras, I have concluded that I generally really do not like plastic mascara brushes! I know they work well for seemingly most people, but with my puny little lashes, I find that these plastic bristles are simply spaced too far apart and it takes many, many coats for me to get decent coverage on my lashes. Another thing I hate about the plastic brushes is that the bristles are just too damn hard and spiky. I don’t have especially sensitive eyes, but these things are constantly poking me in the eye and it’s really annoying. Maybe I’m just getting the brush too close to my eyes, but like I said, my lashes are short and with these brushes, I need many coats—I don’t have much choice! When I finally do get enough mascara on with the plastic brush, the mascara looks pretty good. The formula is not clumpy, not too wet, and dries quickly (but not too quickly). It has a “mascara” smell, but it isn’t overly strong. It gives quite natural coverage and separates the lashes very nicely. (Even though I haven’t got much to separate. Ha!) I don’t get any real volume or lengthening from it. I won’t hold it against this mascara that it doesn’t give me any more curl, simply because my lashes are impossibly stubborn, and I can only use waterproof mascaras (at least as the first layer) since any regular, water-based mascara will straighten my lashes instantly. I mean, I can’t curl my lashes in a steamy bathroom. That’s how straight they are. This mascara does do a good job of holding a curl, though—it’s definitely waterproof! And because it doesn’t deposit much product on my lashes, my lashes don’t get weighed down, either. The color, Rich Black, stays nice and dark, so no complaints there. The staying power of this mascara is excellent, and it is very waterproof. The main drawback for me is that it does smudge on me as the day progresses. I have dry skin, but foundation and sunscreen combined with a hot day means my skin does get a bit oily. My lashes also naturally point straight down and my eyes don’t protrude at all, so lashes often touch the skin under my eyes as they uncurl. Because the formula is very waterproof, it is also a bit of a pain to remove. Even an oil cleanser doesn’t really do the trick, and I do need to use a waterproof eye makeup remover. Overall, I think this mascara would work really well if you already have decently long or thick eyelashes that don’t point straight down. It gives a really natural look and is nicely waterproof. Because of certain eye and eyelash features I have, it just didn’t work that well for me, and I doubt I’ll finish up the tube. Ow! So poky. 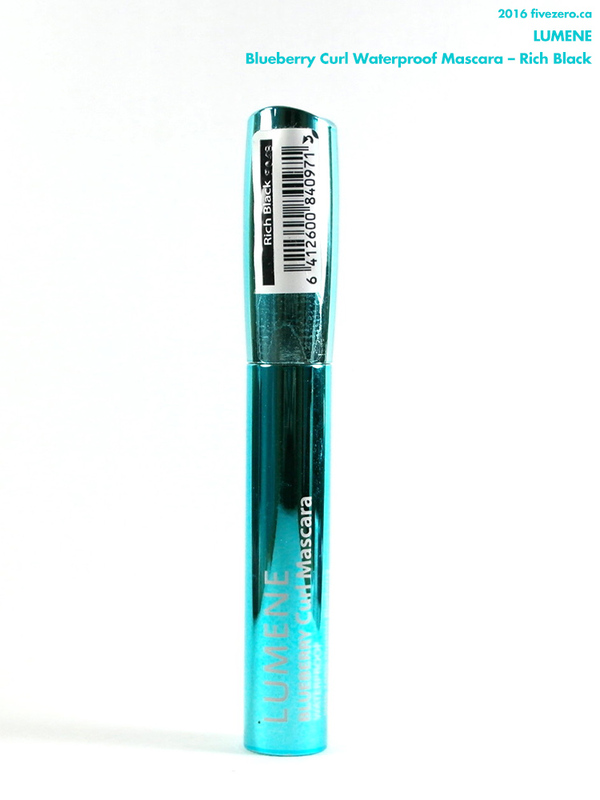 Lumene Blueberry Curl Waterproof Mascara in Rich Black contained 7 mL and was US$9.99 when I purchased it off Amazon. The product has been reformulated and renamed to Blueberry Wild Curl Waterproof Mascara, and it contains 7 mL and retails for about 16.90€ / US$9.99. I cannot find any information on where it is made, although a very recent article from an official Finnish source states that 80% of Lumene’s products are made in Finland. Lumene was founded in 1970 as a skincare company specializing in natural ingredients from the Arctic, such as seaweed extracts, lingonberries, and cloudberries. The name comes from the Latin word for “light”. The company is based in Espoo, Finland, and has additional offices in Russia, Sweden, and USA. Too bad this is pokey. I do find some wands are better than others. I have wondered about replacing some mascaras with a better wand but it all depends on if the openings are the exact same size. I’ve only ever had success with same range like switching the wand from one CoverGirl Lash Blast to another.